Theresa (Tess) Anderson will be joining the Department of Mathematics faculty as a new tenure-track assistant professor beginning August 2018. Tess received Bachelor's degrees in Mathematics, Chemistry, and Spanish literature from the University of Wisconsin-Madison in 2010. 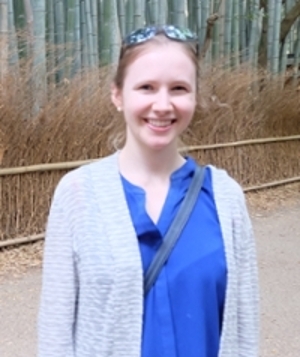 She then went to Brown University on an NSF Graduate Research Fellowship in Mathematics and graduated with a Ph.D. in Mathematics in 2015; her advisor was Dr. Jill Pipher. She returned to UW-Madison with an NSF Postdoctoral Fellowship in the fall of 2015. Prior to joining the Purdue faculty, she will remain at UW-Madison, where she will help run a research experience for undergraduates this summer. Professor Anderson's research interests are in harmonic analysis and number theory, especially the interface of these two areas. Her past work has ranged from bounding singular integrals — operators which incorporate delicate cancellation properties and have applications to a variety of scientific and medical areas — to determining quantitative information about the distribution of prime points on curved surfaces. She has always loved researching a variety of areas and is eager to take on more new directions. Tess speaks three languages and loves to travel, having given mathematical talks around the world. She is always excited to discuss mathematics with students and faculty alike.